Investment News - We're ready to strip! To manage the increasing range of cables required by our customers we are pleased to announce that we have invested in a new high speed automatic cutting and stripping station to complement our existing Schleuniger machinery. Most of the cables we prepare go on to be crimped or soldered to components in one of our dedicated cells before being overmoulded to provide strain relief, high IP ratings and, of course, the high quality finish our customers expect. 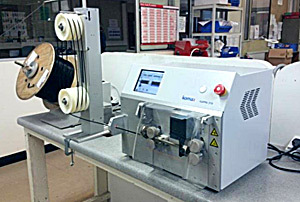 Our new state of the art Kappa wire cutting and stripping machine is designed for the reliable controlled processing of the finest wire sizes from 0.02 to 6mm² and an outside diameter of up to 10mm within ± 0.2%+1mm repeat accuracy. Innovative sensors aid set up and repeatability and make cut losses a thing of the past. If you have a cable assembly or cable overmould requirement where you want a supplier at the leading edge of available technology please contact our sales office, email: sales@inoplas.co.uk telephone: 01202 866000.